Try Continuous Ink System with your Epson Expression Home XP-202 and make 30 times more quality prints for the same money! Pay only 0.04 USD for A-4 full color print! 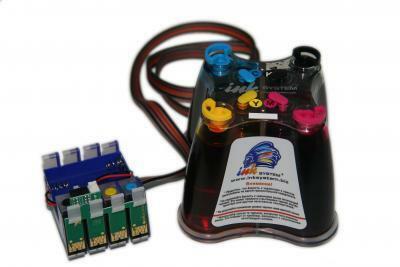 Ink system for Epson XP-202 is a system of five refilled ink tanks, silicone flexible tube and printing cartridges which are identical to the original ones. CISS is made of polycarbonate. This material is solid and wear-resistant. Ink tanks of Continuous Ink Supply System from INKSYSTEM have the same dimensions and correspond to the all-world standards. Tube of this tube is made of silicone of class В«A1В» (by the way, the same class of material is used in medicine). The ink enters the cartridge along a small tube from special ink tanks. The only thing you need is to add the ink and nothing more. The system is very easy and simple in use, that's why even a schoolchild can work with it without any risks of injury and demage. The system uses only photo ink from INKSYSTEM Company manufactured in South Korea. 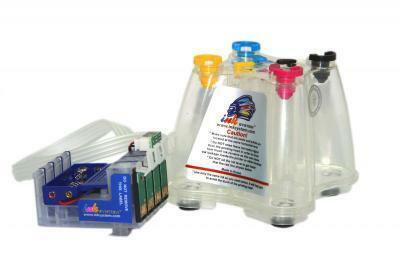 Bulk ink system for Epson XP-202 is high quality at a reasonable price. secondly, continuous ink system Epson XP-202 prevents the appearance of unprinted lines on the printouts. Having ordered any printing device on our site, for example CISS for Epson XP-302, you get it with the installed system CIS. Cis Epson XP-202 from INKSYSTEM Company will solve a lot of unsolvable problems.